Bit new to 3D modelling, and this software especially. Basically, flattened cylinders rotated round one another to make the base; for the concave curve, I isolated part of a cylinder (deleting the rest via mesh select) and inverted it. I'm at a loss how to stitch that bit up. I was hoping that joining them together as a single object and using a command like 'stitch holes' might do the trick, but no dice. Would love to know how, or if there's a simpler/more elegant solution to tackling this kind of thing. This is the best I've gotten with random experimentation. There are lots of ways to achieve this effect First off I'd ignore the dents and draw the full shape with a lathe. Then go back to add the dents. This one uses "Mesh/Voxel Subtract Children"
"Cut From Parent" would work... but in 3.0 Cylinders don't have enough subdivisions to cut nicely. A Cylinder made out of a lathe would work fine. Indeed "Cut From Parent" follows a similar track to what you were trying to do - effectively clipping parts out of two meshes then stitching the holes back together - but to clip the meshes they need to have a fine mesh otherwise you lose big chunks of the model. You can still do this by hand... but I recommend the Voxel tool this time. Oh, that's awesome! Thanks a lot, can't wait to try this out. Brilliant That is a great subject for a first sculpt too! 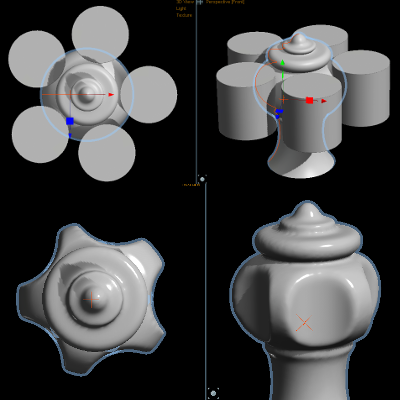 Each of the standard chess pieces offers somewhat different sculpting challenges.